Edinburgh Monarchs’ Knockout Cup hopes appear to hang by a thread after they struggled to score a big lead against Glasgow Tigers in tonight’s first round first leg tie at Armadale Stadium. Monarchs won by a slender 46-44 margin and unless something seismic happens in the deciding leg at Ashfield tomorrow afternoon the Tigers look like going through on aggregate to face Berwick Bandits in the quarter-finals. His team-mate Ricky Wells added: “It’s going to be tough through at Glasgow but we will go there with the best of intentions and try to hang on to that two-point lead. Argentinian Coty Garcia, who was drafted in as temporary replacement for Monarchs rider Matt Williamson, who announced he was taking a break from speedway this week, made a steady start in heat two and scored a third-place point. The race was won by Tigers ace James Sarjeant after Monarchs’ Josh Pickering missed the gate. The points were shared 3-3 as they were in the opening race which was comfortably won by Wells against Tigers’ top pairing Chris Harris and Lewis Kerr. Heat three was also shared with Mark Riss taking the chequered flag for Monarchs and the match was all square at 9-9. Any thoughts that the Tigers would run away with this tie, at this stage, proved unfounded. 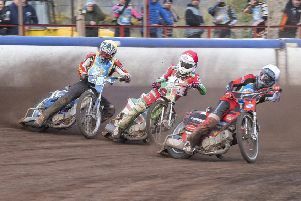 But the deadlock was broken in the next race when Tigers star Richie Worrall, who loves Armadale, got the better of Monarchs captain Erik Riss, and with Sarjeant mopping up third place, this 4-2 gave the Tigers an early 13-11 lead. And the Ashfield men increased that lead to six points, 18-12 in heat five when Harris and Kerr grabbed an easy 5-1 over Mark Riss and Max Ruml who were both sluggish out of the gate. But Monarchs pegged their opponents back a little in the next race, Wells won his second race on the trot and with his partner Joel Andersson picking up third place this 4-2 cut Monarchs’ deficit to four points, 20-16. And Monarchs levelled the match 21-21 thanks to a brilliant 5-1 from Erik Riss and Coty Garcia, who fought his way from the back to claim second place squeezing out Claus Vissing and Paul Starke. Monarchs inched in front in the very next race when Andersson led brilliantly from the tapes. But it was Pickering whose battling qualities were to the fore as he grabbed third place for a 4-2 verdict to the home side who now led 25-23. Mark Riss won his second race of the meeting in heat nine to secure another shared race which kept Monarchs in front 28-26 and it was everything very much to play for at this stage. Wells won his third race of the night for Monarchs in heat 10 and with Andersson picking a third place point again, this 4-2 verdict edged them four points in front, 32-28. The Tigers did not look as if they had much in their tank as Monarchs put their foot on the gas. And Monarchs kept the pressure on the Tigers with Erik Riss winning his second race in succession in heat 11 for yet another shared heat. Monarchs then added to their lead with a decisive 4-2 in heat 12 courtesy of Mark Riss who defeated Vissing and Sarjeant for a resounding win, and with Pickering earning a third-place point, Monarchs now led 39-33. Worrall handed Wells his first defeat of the night in heat 13 as he had no answer to the fast-starting Tiger. But with Erik Riss in second place this shared race maintained Monarchs’ six point advantage. But the Tigers gained a lifeline in the penultimate heat when they pulled off a telling 5-1 thanks to Starke and Sarjeant over Garcia and Pickering. The Tigers were just two points down now 43-41 with one race to go. Tigers’ top star Harris was disqualified in the final heat but Monarchs couldn’t cash in as Worrall won the race for the Tigers for a 3-3 which places the tie very much in Glasgow’s favour. Monarchs: Wells 12, E Riss 11, M Riss 10, Pickering 5, Andersson 5, Garcia 3, Ruml 0. Glasgow: Worrall 13, Kerr 7, Vissing 6, Harris 6, Sarjeant 6, Starke 5, Thomas 1.